The client arranges digital event services providing interesting activities for various clients around the world. They were running an event to celebrate the Formula One in Bahrain and they wanted an activity relating to the car race. The equipment needed to run for 4 weeks in an outdoor location in a hot and sandy environment. Every so often a project comes along that would have been the envy of my childhood self! 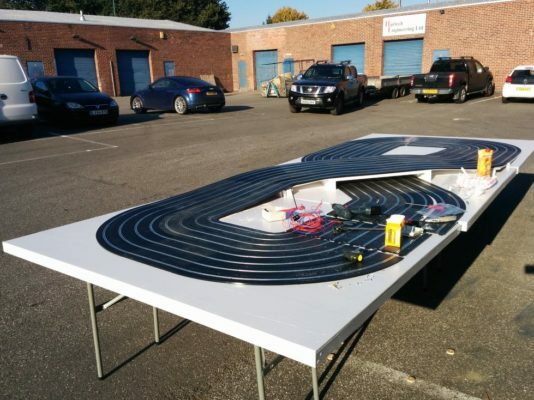 This was one of those projects – I was asked to build a eight car pedal-powered Scalextric system. We provided a set of eight pedal generator stands, a control box and a large 8 lane Scalextric board. The client provided the bicycles which were bought locally. 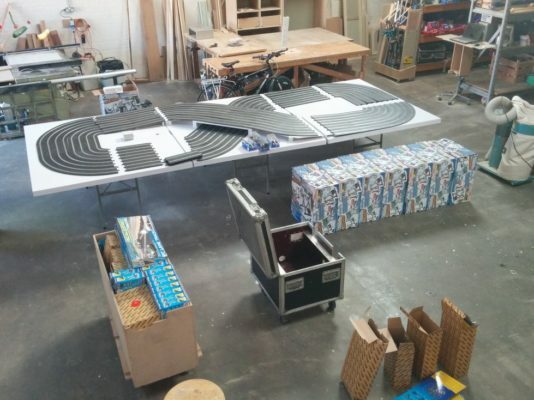 The final 8-bike pedal Scalextric system was built within a very tight 10 day timescale it needed to be sea-freighted to the first event in the Far East. The pedal generators were ‘roller’ style generators based upon bike ‘turbo’ trainers, used for practising cycling indoors. We designed and got CNC laser cut a special bracket to fit the generator onto the bike trainer. 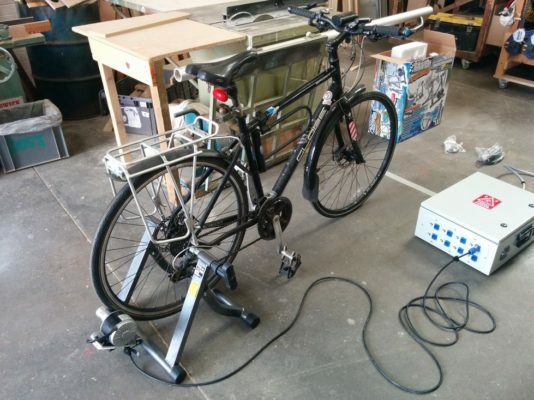 An aluminium roller is attached to the generator, which links the bicycle to the generator. The control box needs to regulate the output from the generators (to stop any damage to the Scalextric cars), but it also needed to provide some resistance for the cyclists. This was done using a number of low value resistors. The system has good-quality plugs/sockets so that the generators and the Scalextric can be easily disconnected and packed away.